Understanding the two most popular grilling styles, Direct and Indirect, is essential for creating a perfect grilled entrée. There are instances when both Direct and Indirect methods are appropriate. The Direct method sears the food in order to create a flavorful crust on the surface, followed by Indirect to prevent burning the outer area of the food while cooking evenly. The following is a quick reference for cooking methods and approximate cooking times for poultry and fish. Chicken Legs Direct 15-22 minutes each side Grill with chicken legs placed 5-6 inches above direct fire. Medium heat to prevent drying out. Chicken, Whole Indirect 15-20 minutes per pound Use medium heat to prevent drying out. Keep grill covered. Turkey, whole (unstuffed) Indirect 20-25 minutes per pound Use medium heat to prvent drying out. Keep grill covered. Filet and Whole Fish Direct/Indirect 5 minutes on each side, per thickness inch. ie: 2 inch thick = 10 minutes on each side. Measure filet at thickest point. For larger filets, make a small slash in the thickest part of the fish to ensure even doneness. If grilling directly on grate, sear with Direct heat then continue with Indirect (or raise grate to at least 6 inches above fire). Rub with oil before grilling to seal in moisture. When Indirect grilling, remember to keep lid closed. Opening the lid can add from 10-15 minutes onto grilling time. Do not use a fork to turn the meat as you are grilling since the piercing causes the juices to escape. A long-handled spatula or tong is more appropriate. 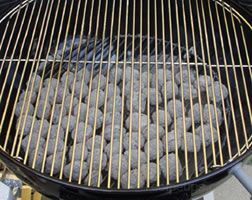 Oil grates with no-stick spray (or brush oil on grates) before starting grill to prevent food from sticking. Keep yourself, friends and family safe from food borne illnesses. To accurately check temperature, the thermometer must be inserted through the thickest part of the meat and away from any bones since bones conduct heat. Poultry is generally safe at 160º F, however waiting until it reaches 180º F is recommended. Flatten chicken breasts so that they are more uniform in thickness. If cooking a whole chicken, it should be butterflied for even cooking. To butterfly, cut along each side of the backbone and then remove it. Turn chicken breast side up and use the heel of your hand to press down on the breast to break the breastbone, flattening the chicken. Use skewers to help the meat lay flat by threading one skewer through a wing, through the breast, and out the other wing. Thread a second skewer into a thigh, through the bottom part of the breast, and out the other thigh. When grilling or broiling, the chicken will have a tendency to dry out so it must be watched carefully during the cooking process. Coating the chicken with a little oil or marinating it will aid in preventing it from drying out while cooking. A medium heat should be used when grilling chicken. Using too high of a heat will cause some parts to cook too quickly and dry out while other parts will not be cooked all the way through. When selecting a whole turkey for grilling, it is best to choose one that is not too large. A 16-pound turkey is the largest size that is safe to grill. The grilling process does not allow the internal temperature of larger turkeys to reach a sufficient temperature quickly enough to destroy harmful bacteria within a safe time period. A smaller turkey is also easier to handle when moving and turning it on the grilling surface. To prevent dryness, leave the skin on the chicken during cooking, which helps preserves the chicken's natural moisture. To speed grilling or broiling time, partially cook the chicken in the microwave first. Microwave on high approximately 4 to 5 minutes per pound, or 3 to 4 minutes if using cut up parts. Grill or broil the microwaved pieces of chicken immediately to finish cooking. Fish is cooked when the meat flakes easily with a fork and appears opaque all the way through. If any of the meat is still glossy and translucent then it is not done. Fish has a tendency to dry out and break into small pieces. Keep some fresh lemon juice handy while you are grilling. You can brush this on while you grill to add flavor and keep the fish moist. Wrapping fish in tinfoil also keeps fish moist and prevents sticking. Spray inside of aluminum foil with no-stick spray to prevent sticking. 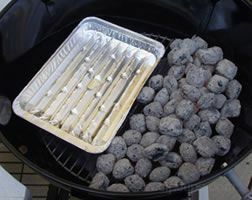 A grill basket makes grilling fish, especially smaller pieces, considerably easier for cooking and clean-up. Be sure to spray or brush the basket with oil to prevent sticking.